New 60 Hp NANNI engine installed in 2013 in exchange of a 42 Hp PERKINS. Only 300 Hours since 2013. HAINES 37 LS for sale in Burgundy France. 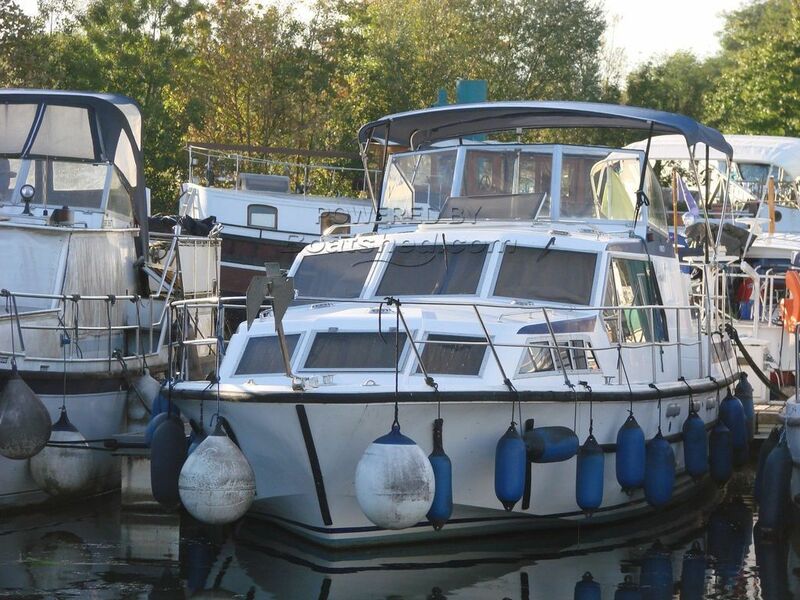 Boatshed Bourgogne is pleased to offer this 1992 river motor cruiser for sale built by the famous English yard HAINES. This ex hire boat has been looked after by her current owner, new engine changed in 2013, Antifouled in 2014. This river and canal cruiser is situated in a quiet marina central France, next to the Saone River and connected to a huge range of other canal routes, moored in a marina with all the facilities on site and shops in a nice little town too. Mooring is transferrable. Suitable and ideal for a family or a group of friends, this boat could accommodate up to 8 persons, in 3 different cabins, 2 heads 2 showers, 2 fridges, 2 helms, a great fly bridge to entertain. For more information or organise a visit, please contact Graham, your local broker at Boatshed Bourgogne. This Haines 37 LS Ex Hire has been personally photographed and viewed by broker agent of Boatshed Bourgogne. Click here for contact details.